Scenarios of worker and student strikes, mass protest, and general dissent became common sights in European cinema surrounding the international political unrest of 1968. Jean-Luc Godard directed La Chinoise and Weekend, both 1967. Pier Paolo Pasolini took a more metaphorical approach towards decadent, bourgeois power structures in Porcile (1969); this being said, it may have been Pasolini’s personal commentary on matters that was more pertinent. Later, in Germany, Rainer Werner Fassbinder helmed such classics as Ali: Fear Eats the Soul (1974) and The Third Generation (1979), which take quite different, yet equally effective stances on states of oppression and resistance. 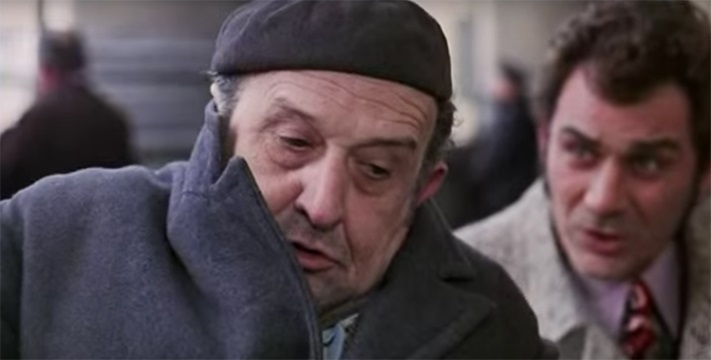 The other thing that ties Godard, Pasolini, and Fassbinder together is that they are all easily put in the enfant terrible category, public figures who were just as, if not more, recognizable than their actual work. Meanwhile, there are some filmmakers of a similar ilk that cinematic history, at least in the US, seems to have forgotten. Alexander Kluge (pronounced Kloo-Guhh) began his career as a lawyer, notably for critical theorist Theodor Adorno, before turning to short films and eventually Yesterday Girl (Abschied von Gestern) in 1966. His films have an almost academic quality to them, perhaps because of his relation to the Frankfurt School for Social Research. Elio Petri, a former member of the Italian Communist Party, is now perhaps best known for the brilliant Investigation of a Citizen Above Suspicion (1970) which won an Academy Award for best foreign language film that year. Here I will be focusing on Petri’s 1971 film The Working Class Goes to Heaven and Kluge’s Part-Time Work of a Domestic Slave of 1973, both of which deal directly with the crisis of workers’ rights and individuality within unionization. Both filmmakers owe ideological and stylistic debts to Bertolt Brecht, the German playwright who also had a massive influence on Godard, Pasolini, and Fassbinder. Lulu likens his body to a factory early in the film, and goes on to equate the machine he works with as a sexual object. As he works, he envisions the posterior of an attractive woman, claiming it creates a rhythm conducive to production. Occasionally the whitish fluid that lubricates the machine splashes onto his face, reminiscent of a seminal climax. Ironically, he has difficulty performing sexually with his girlfriend Lidia (Mariangela Melato). This kind of psychoanalytic fetishization of the machine, the displacement of sexual energy, could be considered an undiagnosed neurosis that relates Lulu to the character who seems to be his only true friend, Militina (the always great Salvo Randone) who resides in a mental institution. When Lulu visits Militina, one never gets the idea that the older man is mentally disabled enough to need institutionalization. That being said, by the end of the film, it seems as though Lulu will go on to suffer the same fate. This notion of factory-to-institution, and Lulu’s constant mentions of Militina throughout the film recall the core beliefs of the German Socialist Patients Collective (SPK), created by doctor Wolfgang Huber right around the same time of Petri’s production. The SPK is generally known for an agenda that claims capitalism begets mental illness in that it is a counter-intuitive system meant to cause anxiety among the affected population. Without even referring to this provocative activist group by name, Petri’s presentation of Militina embodies this kind of theme, suggesting that exploitative factory work leads to mental illness. As Petri once stated, “Illness is now normality.” Lulu’s bond with Militina, a former worker who seems to be completely unknown to others in the factory, implies that his life trajectory will have a similar outcome. As Lulu’s behavior becomes more and more odd, it does not necessarily mean that he (or Militina) need to be housed in a mental institution, but may benefit from some psychiatric help. In one scene he is examined by a doctor who appears to be employed by the factory, showing that the ruling powers have already co-opted the practice of mental help to their benefit. The dismissal of Lulu’s individual problems indicate that the activists will not provide help either. Lulu Massa is left with no one to turn to during an existential crisis. Alexander Kluge’s Part-Time Work of a Domestic Slave is another character study, although it focuses on a woman protagonist who, like Lulu, cannot find a proper place in union labor. Roswitha Bronski (the director’s sister Alexandra Kluge), an under-appreciated mother and wife, has a discreet part-time job as an illegal abortionist. After her covert operation is compromised by the police, she begins studying possible political actions with a friend, eventually getting into trouble trespassing on the grounds of her husband’s employer. The film ends with her working in a factory canteen, handing out political flyers hidden as hot dog wrappers. It seems as though none of her work is taken seriously, most likely because of her gender, and shows the isolation she faces while attempting to participate in socialist/communist actions. What separates Kluge’s film from The Working Class Goes to Heaven is that it shows the difficulty women have trying to find meaningful work. In Working Class there is only one woman employed by the factory, who is basically in the film just to be an object of Lulu’s desire. Part-Time Work shows the difficulty women had finding work outside of the household. As one of the unattributed quotes Kluge uses as a title card notes, “Give me a foothold outside the family and I will move the world.” The very expectations of Roswitha as housewife constrain her from employment that workers like Lulu take as a given. Part-Time Work, which was released during a decade of constant struggle over the legal status of abortion (which has never really abated), shows the medical procedure in almost documentary fashion, dead fetus and all. It takes the reality of the issues quite seriously, while also using storytelling techniques that remind viewers of the cinematic process. 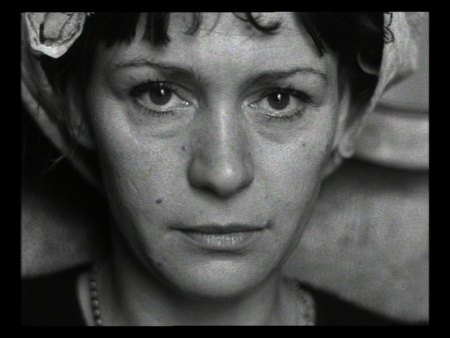 The film opens with a shot of Roswitha’s tired face. A voice over calmly states, “Roswitha feels an enormous power within her. Films have taught her that this power really exists.” This is followed by a brief scene from a film about Russian soldiers in World War II, followed furthermore by a quote from Friedrich Engels. Within these first two minutes, Kluge has already distanced the viewer from the reality of narrative cinematic practice in true Brechtian form. Brecht, known for his Weimar era plays and so forth, such as The Threepenny Opera (1928), Baal (1918), and later Mother Courage and her Children (1938), would often break the fourth wall, having his characters address the audience directly, or make the motions and spectacle of musical numbers so over the top, so as to take the characters out of the story, forcing the audience to consider the implications of this.